What could be a better end to a terrific theatre season than a beginning! Samford’s School of the Arts musical production of Children of Eden takes place in the Wright Center, April 26-29. The production is part of Samford’s Michael J. and Mary Anne Freeman Theatre and Dance Series. 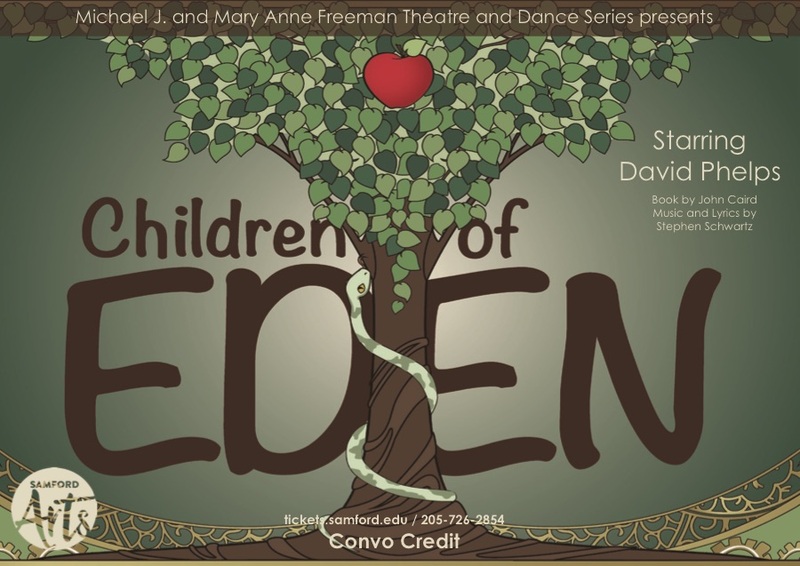 Based on the story of Genesis, from musical theatre greats Stephen Schwartz and John Caird, Children of Eden is a joyous and inspirational musical about parents, children and faith. Adam, Eve, Noah and the Father who created them deal with the headstrong, cataclysmic actions of their respective children. This not-to-be-missed event stars Samford students and David Phelps, who is considered among today's most spectacular voices. His seemingly endless vocal range, which extends more than three octaves, coupled with his gift for communicating a song, has brought the house down in the world’s most prestigious venues. For more than 15 years, David served as a member of the popular Gaither Vocal Band and during that time received numerous Dove Awards, Grammy Awards and multiple platinum-selling recording projects. As a soloist, he received 2009 Dove Award nominations for Male Vocalist of the Year and Long Form Video for the Christmas DVD, O Holy Night, to add to his many awards and honors. The School of the Arts originally produced Children of Eden in the spring of 1998 when Don Sandley, professor and former chair of the Department of Theatre and Dance, first joined the program. Sandley says, “The work was new and we were the first college in the South to perform it.” Sandley added that he is excited to have the opportunity to revisit the production with a new cast, an incredible set design and puppetry. The School of the Arts will celebrate its 10th anniversary of the naming of the school at the April 26 performance, and the Samford campus will be treated to a cupcake celebration and free admission.